From February 2010-November 2013, my family cooked and ate a meal from the world’s 195+ countries and territories. We shared our experiences so you can do it, too. Use this interactive world map to explore the countries we cooked. 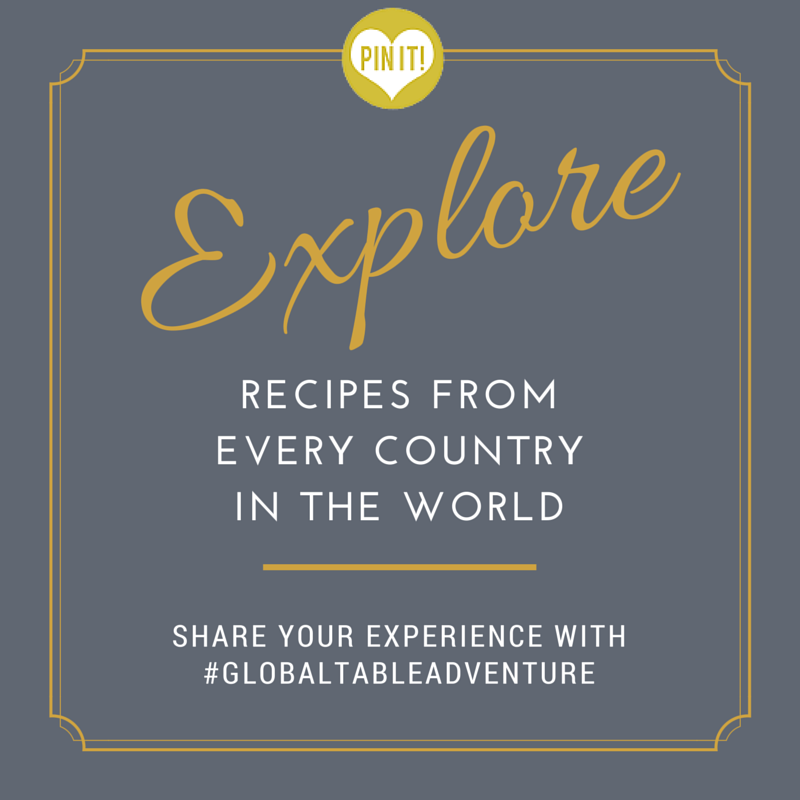 To begin your tour, simply click a pin and link to all recipes and posts about that country (or use the search box at the top of the page to find exactly what you’re looking for). You’re sure to find something yummy to try! We did it! The Celebration Post! When I started this adventure, some experts said 192, while others said 194, or even 195. Lacking any sort of expertise in geography, I chose 195 for one simple reason: to experience more cuisines. This number includes Taiwan which was technically not a country at the time of the Adventure. Also, South Sudan was added since GTA began, so we ended up cooking 195 countries, plus Taiwan. Later I added Palestine which brings the number to 197 total countries and territories. There is also debate regarding which countries belong to what continent. I am at the mercy of geographers in this area as well – I just want to eat food from around the world! My sources: 1 and 2. This map is amazing, especially with links to your recipes. Very cool!! Well, except a few problems. First, the interactive map’s stars cover the names of the countries. Second, when i click on a country from the alphabetic list below it brings me to a page with recipes, which is fine, HOWEVER, the page is missing a map with the exact location of the country I selected!! See! Yes, it says it in small print at the top, but pictures are worth a thousand words. Then to make it more confusing, on the far right side there is a map with one pin in it, so I first assumed that was where this country was located, but no, its not related to the location/recipes at all, its an ad or something. If you can fix these two issues, asap, it’d make it much, much better. I love the map feature you added to your site. It’s a great addition to help share your adventure – especially for those who are just finding out about your blog. Linking to the recipes of those countries makes it perfect. I was thinking of doing what you are doing. I went to the internet and wrote all the names of the countries down but never went any further. I was just talking about it today, cooking foods from around the world. I never, ever want to get into a rut with dinner. So, thank you for doing this and allowing others to follow you. I will be watching and learning every day. Thank you again! Julie, I’m so glad you found your way here… welcome! There’s so much we can learn from other cultures to keep our own food interesting – little tweaks of techniques and spices can totally change a once boring dish into something new and exciting and *globally* inspired. I JUST heard you interviewed on RIck Steves’ Travel Radio Broadcast while driving and immediately came home to look “you” (and this fantastic blog) up to find it even MORE inspirational than expected. THANK YOU so much. I’m going to be here daily! 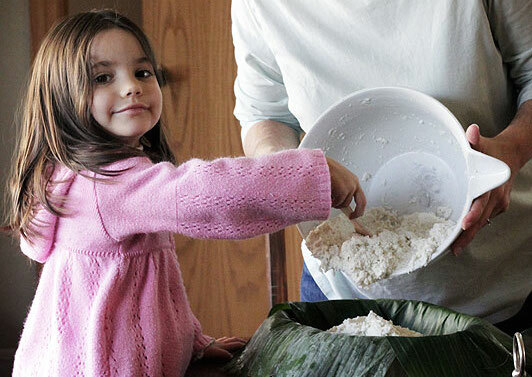 When my kids were growing up, homeschooled, we all cooked together daily (great time for math) We had a weekly “Refugee Dinner” of JUST rice (no butter or salt or pepper, or ANYTHING) and put the money we saved NOT cooking something we’d prefer into a special “bank” to give to a local missionary. Each week we learned about the poor in a different country and what they had to eat (usually rice, but often Borscht or some kind of root veggie) It was an experience my kids still appreciate (in their 20’s now) to this day.Hope this gives mother’s with young ones at home some cool ideas for teaching how others in the world have to live and realizing how RICH we ALL are in America! THANK YOU!!! I, too, heard you on Rick Steves’ program and added “Stove Top Traveling” to my New Year’s Resolutions! We host a dinner party every other Friday, and themes works so well. Your thoughtful vision and incredible organization will help so very much! And, Lisa’s refugee dinner, above, is also inspiring. Happy eating, happy peacemaking! I’m a 6th grade Social Studies teacher, and I have added this site to my students’ COUNTRY PROJECT optional activities (or at least those whose countries have recipes here). In addition to their written reports, some of my kinesthetic learners have prepared a recipe and shared a small sample with their classmates on their project presentation day, while some of my visual learners have created a collage project of the ingredients and steps for putting the meal together. Food is a great way for students to explore the culture of a region, and your recipes have added a lot of fun to our classroom. I’m looking forward to the next school year when all of the countries have recipes for my students to include with their projects. Thanks! I’m honored and thrilled to have you share this project with your students. I love the different, creative ways the students have chosen to present the information to their peers – the collage sounds lots of fun. Thank you so much! Absolutely love your blog. Read at least twice a week…a movie in the makes? Keep at it, for the international foodie in all of us. Thank you so much, Jane 🙂 So glad you are enjoying the Adventure! Wow, really? That is fascinating! For now I’m cooking the official list of world countries, but I’d be interested in tackling something like this after the 195 countries are done. Maple Borscht sounds so tasty. http://www.mongabay.com/igapo/world_statistics_by_area.htm 239 countries according to this web site Oh well just means more cooking! This list includes Greenland, which is technically in the Kingdom of Denmark… but yes, there are many territories and lands that could expand this project ever more! I just heard about your website from when you were on Rick Steves. What a great idea! 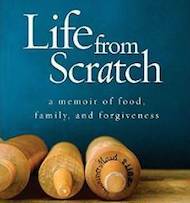 I am excited to read up on your past meals and will look for some inspiration. My fiance is from Europe and is always impressing me with his meals. I might be able to surprise him a time or two. Keep up the great work! the favor”.I’m attempting to find things to enhance my website!I suppose its ok to use a few of your ideas!! What about Scotland? I just read some debate about it. Looks like you are choosing to do United Kingdom instead of Scotland, England, Wales and Northern Ireland separately? Hi Aimee, I decided to stick to the “official” list of countries to keep things simple, though the world isn’t always clear cut with borders. So, yes, I did the U.K. I hope to add some more dimension in the next months by covering some of those which we couldn’t give our full attention to in the first go round. You missed Palestine, I believe. What a great idea. Congratulations on cooking through 195 countries! Chapeau. I would have loved to virtually travel through the world with you every week but unfortunately I only stumbled upon GlobalTableAdventure this morning. I am looking forward to your future posts. I came here looking for recipes from Guadeloupe, only to find you didn’t do it! What a shame! I absolutely love your blog! It is such a great way to learn about places all over the world that many people have never even heard of, and also to teach your daughter the same. Keep up the brilliant work! Pingback: 13 funny kids from all over the world, plus the food they eat. Awesome! But you forgot Palestine! 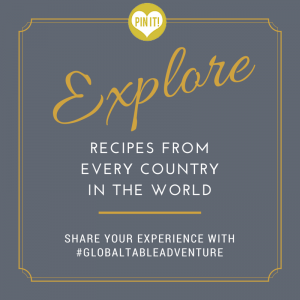 Pingback: Would this be your favorite recipe after visiting every country in the world? I really appreciate your global cooking, it has inspired me a lot. Today I will cook a South African lamb bredie with pumpkin. Why make ordinary already known local food when you can go global? I see you have a bonus section with Palestine. Wonderful, but I will give you a tip for another bonus “country”. This country is a country within 4 countries, Northern parts of Norway (where I live), Sweden, Finland and Russia. It is the Sami people. They are the native people of this region, and have their own language, culture, religion and wonderful clothes. The Sami people is comparable to Kurds in several countries in the Middle East, so you can maybe have a Kurdish bonus section as well. My favorite food is actually a sami dish. It is not possible to buy here in Norway, but in Sweden it is higly popular. It is the dish named Souvas. Souvas is smoked reindeer meat, and can be served in many ways. I have had it with tagliatelle and a creamy sauce, as fast food with pommes frites and salad (really good). They serve it also in pita bread as a Nordic kebab. Fry the meat in butter in a frying pan, add onions (optional) and fry until onions softened. Add sour cream (the sauce should be creamy, not dry), add salt and pepper to taste. Voila! Serve with mashed potatos, boiled potatos or rice, and maybe some cooked vegetables like cauliflower or peas. The dish is sooo good, unbelievable! Okey, smoked reindeer is hardy available here, and for sure not in America. But any smoked venison will do. Smoked reindeer is expensive in Sweden, where they sell it in supermarkets, but they have cheaper varieties made from smoked deer meat, and that is as good in taste. I am sure you can find smoked deer in America. It has to be thinly sliced, preferrably readily sliced, as the slices for middle eastern kebab. Thank you for a fabulous blog! And I spelled it wrong. Suovas, that is what it is called. not souvas. Suovas is a sami word for smoked, and the meat is salted before smoking. In Lappland, peaple smoke their meat heavily. Wow – Rune – this is so interesting. Deer is quite available in Oklahoma – I know several folks who make deer jerky, actually. Anyway, I’ll definitely dig into Sami culture to learn more – thank you for the suggestion and explanation of the food! Hello, my name is Guan sublime, I come from China. When I first saw your story, it made me feel very shocking. You were so terrible. I can see that you love your daughter very much. It’s a very happy family. Your daughter is very, very lovely. I like her very much and see her grow healthy and grow up. I am also very happy to have a happy childhood and hope to make friends with her. I’m looking forward to your reply.